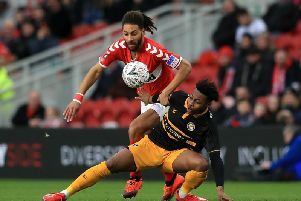 Middlesbrough midfielder Grant Leadbitter is linked with a return to Sunderland - and both set supporters have reacted to the news. Fresh reports have suggested the Black Cats are eyeing a reunion with the Chester-le-Street born midfielder, 10 years after selling him to Ipswich Town. The 33-year-old has been surplus to requirements on Teesside so far, predominately featuring in cup matches, and restricted to just two Championship appearances. Should Leadbitter end his seven-year spell at the Riverside Stadium, social media reaction suggests Boro fans will give him their blessing. However, the Black Cats-faithful are split over the news, with some believing Sunderland's priorities to strengthen should lie elsewhere. @Coombs2Joseph: "Leadbitter is a Boro legend. So many great moments include him". @LeWJeW92: "Love you Grant go play yourself some more football we’re it will be appreciated". @raidovermoscow: "Win-win would be a loan, and then a future role within the club. Not a character that I'd want to lose.. Especially to Sunderland's gain." @weareboro: "Hope he gets the move. Great servant to the club! He’d still do a job in most Championship teams but I’m sure it’s a move he’d be happy with, keep him in the North East as well". @MalcolmKidd1: "Grant has been a brilliant player and captain for the Boro and he ran the recent game against Peterborough. To be honest, I’m sure he would do better in the team than some that turn out for the league games - where ever he ends up I wish him well". @JamesCopley73: "Would be nice to see the deal come to fruition for nostalgic reasons but isn’t he similar to what we already have? We need energy, pace and athleticism not a 33-year-old passer." @ChrisBo_ "Would absolutely love to see Grant Leadbitter back in a Sunderland shirt, was the first ever name I got printed on mine make it happen lads". @mickynapier: "Think we’re well stocked in the middle of the park, it’s not as though Leadbitter is different to what we’ve got, could there be a departure? Cattermole?" @Scookie555: "Not what we need - too similar to Catts, McGeough. We need someone big, strong, athletic, who can really get about the pitch". @Leech27Tom: "Think I'm in a minority that this would be a great signing, Mumba played in the league hand full of times, power don't know what your gonna get, catts just come back from injury looks slow. Honeyman injured, mcgeoch looking decent."